Biscotti Babe by BelleTress is a super-stylish, soft, virtually shine-free, textured, asymmetrical bob with beautiful boho beach waves. She features a 100% hand-tied lace front with a monofilament top and an open wefted cap—and she's heat-friendly too! - Sides: 10 - 13", Nape: 5 - 6", Back: 12 - 13", Overall: 10 - 13"
Biscotti Babe by BelleTress is an on-trend wavy bob with tons of texture and style. Biscotti Babe can be worn as is, or heat-styled straight to be worn as an A-line bob. Textured bobs are chic, cool, and extremely stylish—especially when paired with a dramatic neckline. Best of all, they're almost universally flattering! I really wanted to like this one. The hair itself is beautiful and silky. Great color and style. The lace front is so scratchy that it left actual scratch marks on my head. I do have sensitive skin; however I own multiple Jon Renau and a Raquel Welch that have much much softer lace. I also feel like this runs smaller than average. It didn't come close to covering my own hair around the ear tabs. My other wigs are also marketed as Average size. Unfortunately, this will be going back. Cate F. Reviewed by Cate F.
In love with Biscotti Babe! I was not sure I’d love this wig based on the online pictures but I was so pleasantly surprised when I tried it on! I got it in Coffee with Cream and it is effortlessly beautiful. I have some darker rooted bio hair with blonde highlights. Even pulling out the blonde in front looked great with the color and not at all fake. The hair feels beautiful. I have never received so many compliments on my hair. Even my son thought it looked great! I had to curl the front section on the right away from my face but once I did that it was perfect. The heat friendly fibers do get tangled and stick together after a while but it wasn’t as bad as I feared. I think the length helped with that. The only negative I can think of is that I have a smaller head and the bra strap style adjuster doesn’t stay as well as I would like it to, but it doesn’t bother me enough to take it down a star. Highly recommend! This shoulder length style has very few friction points of rubbing so the heat friendly fibers will likely not wear too quickly. It has a well done lace front with monofilament. The fibers feel just as real hair with some fly aways, as often occurs with biohair. 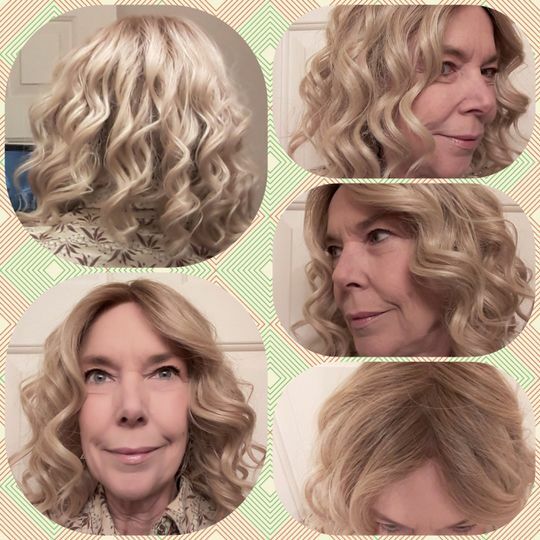 The color, champagne with apple pie has rooting which looks natural to the blonde locks; a nicer affect than the brown rootings of other types of wigs. I have a petite head size and the ear tab coverage is excellent. The wig cap fits average and I can easily fit it with the bra type adjusters. I could drink coffee all day with Biscotti Babe! Loved the color but it did not look good on me and felt like too much hair. I really did not like the feel of the hair fibers but I think that is just a personal thing. Karen Perkins A. 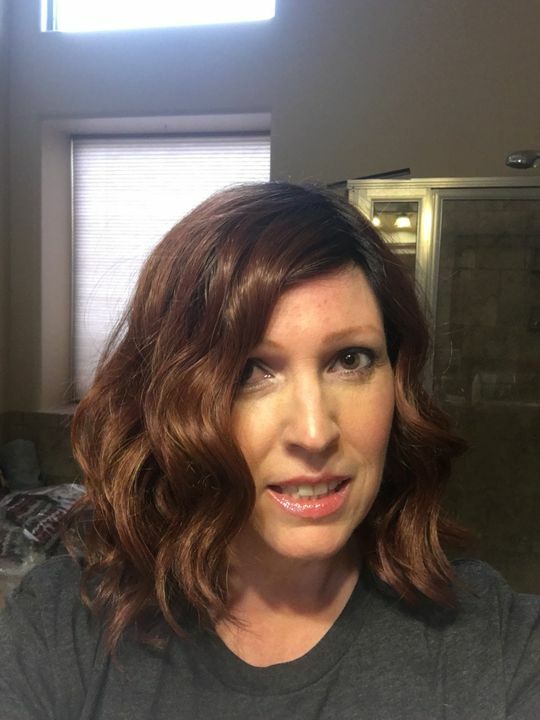 Reviewed by Karen Perkins A.
It’s a pretty color but the front curls keep falling in my face. I may need to play around with it some more to get it to lay right.